Home / cable ski singapore review / cableskiing singapore / east coast park review singapore / singapore wake park review / water sports singapore / what to do in singapore / what to do over the weekends / Trending: The One and ONLY Newly opened Singapore Wake Park. It was a weekend full of fun and laughter at the eastern side of Singapore. Less than a month old, the Singapore Wake Park has made its mark after a two year hiatus and a change in management. There were several new features — an all-new state-of-the-art cable systems that now separates the beginners, the novices and the wakeboard enthusiasts. Learn at your own pace and space, guys. Being someone who does not do any exercise at all (you can tell that my life is all about food), I was really glad that the beginner system exists. Read on to find out how you can enjoy a 1-for-1 ride at the Singapore Wake Park! For the record, Singapore Wake Park is not the 'dong dong chiang' wake that you have under void decks. I say this because one of my friends asked, "Why are you so enthusiastic about going to a funeral over the weekends?!" *facepalm*. The new cable-ski facility at East Coast Park now features THREE, I repeat, THREE, state-of-the-art cable systems. This so that we can all learn and try new stuns at our own pace and space. Ladies and gentleman, presenting to you the very amazing cable skiing sport. The park is so huge, I'll need a drone to capture it. Samantha gave us a really insightful introduction to the Singapore Wake Park. We were given the Easy Up Board (a board that is meant for beginners), as well as a helmet. You can either choose the left foot or right foot board, and the helmet comes in various sizes. Are you left-foot forward or right-foot forward? The ski park also has large overhead cables and stadium lights — which means that you can skii at night and everything would still be visible. The beginner system has an adjustable speed increase from 0km/hr to 25km/hr. The speed varies according to participant's weight and riding ability during activity. The instructors were not only sharp and analytical — they were very patient and gave a detailed breakdown on our body posture. One of them was able to correct my every move — and even swam all the way across the lake towards me when I was figuring out where to swim to. The Beginners' System is so safe and easy to use that children as young as six years old and seniors in their 50s can also learn the basics of wakeboarding. I've seen some really young kids gliding across the water! Don't worry if you can't swim — the life vest will help you float. All you have to do is KICK! It was indeed a memorable and fun experience. By the way, the water may look dark and muddy but it has been approved by the government as safe. The operations team does daily maintenance in two shifts. You may see some fishes in the water as the water comes from the sea through a filter system. Bring along your own padlock — there are lockers in the toilet. Put on lots of sunblock — thankfully, there weren't much sun when we went there from 10-1pm. Eat before you play — you'll get REALLY hungry. Sign the indemnity form online to save time. 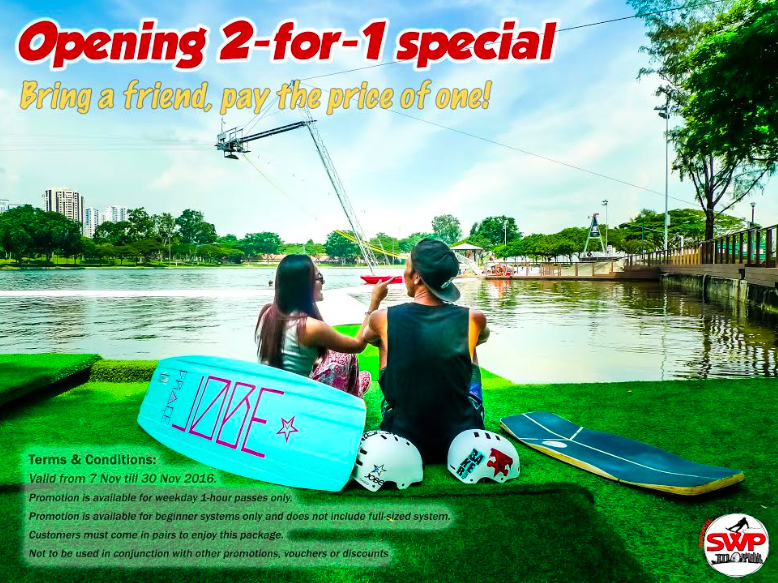 For rates, please visit Singapore Wake Park website. By Bus: Buses 401 (operates only on Saturdays and Sundays) and 197 from Bedok Interchange. Alight when you see Laguna Park condominium and walk through the underpass. *Note: The bridge from East Coast Lagoon Food Village leading to Singapore Wake Park is closed for construction until further notice. Please enter from Carpark E1 or East Coast Seafood Centre.